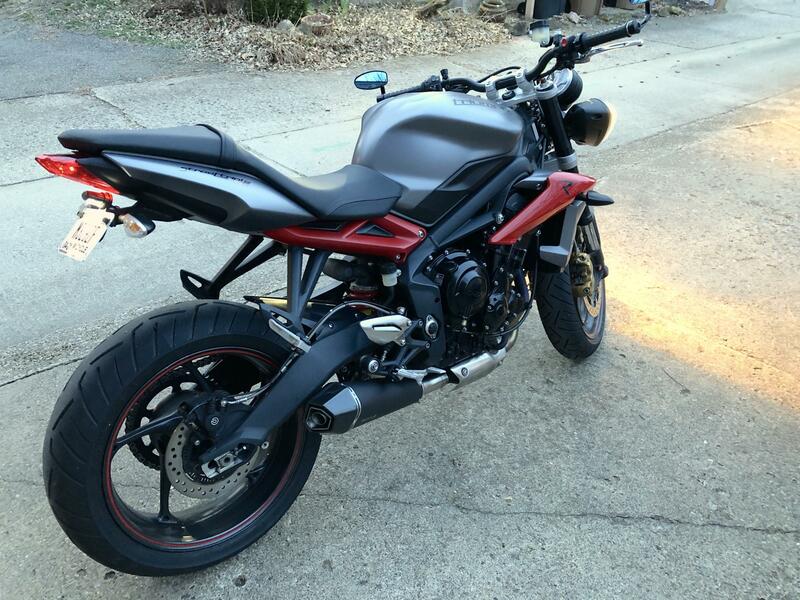 I bought a 2014 Triumph Street Triple R from a private seller and it came equipped with the S1R Two Brothers Exhaust. I checked and it also has the P1X insert (the quietest one). He also told me it had the ECU tune for the Arrow exhaust (not sure what that entails). To me, it is still too loud and really just drones when cruising at 5-6k RPM. Any suggestions for an aftermarket exhaust? My research has pointed me to the Scorpion Serket. I'd like to be slightly louder than stock and maintain the weight savings and performance benefit of an aftermarket as much as possible. If it works with my current tune that would be great too. Don't feel like spending more money at a dealer to re-tune it. Side note - if I do find an alternative exhaust, I would be more than happy to sell the Two Brothers exhaust to someone on here! I’m in the same boat; bought a 2013 with the Two Bros can and added a P1X. It’s too loud in my neighborhood, but I’ve begun to love the sound while out riding. I do feel bad when someone has their window down next to me in traffic, so I need to change it out. My research has also pointed to the Scorpion Serket. However, a few posts have been a bit concerning with respect to quality, and I’m now heavily considereing the Remus Hypercone. I don’t love the two finish options of the Remus, but the quality seems pretty good. I do believe it’s a bit louder than the Scorpion with the dB inserts installed, but I’m trusting YouTube and written reviews. The Two Bros can looks better than both of those options... which is unfortunate. I've had the Remus on my bike since about October 2013, and really like it. A little louder than stock with the street baffle in, but the sound quality is excellent, IMO. Also, for the 2013-2016 bikes there is only one slip-on tune for the ECU - the "Arrow" tune. The only way to get a different one would be to install a piggy-back system like a Power Commander and tune it yourself. Just because I'm paranoid, it doesn't mean the whole world isn't out to get me. My life is not without meaning. I can be held up as a bad example. What specifics have you thinking the Serket is low quality? The reviews I looked at seemed pretty favorable. I also like that it costs ~$150 less than the Remus. Could definitely be interested in the Two Brothers if you end up selling. Yeah, I removed the P1X from my 2Bros this weekend and went for a ride. I had forgotten how much of a difference the insert made. The exhaust was much louder and the sound was less pleasing than with the silencer installed. My Remus will be delivered today, so depending on how much I like that, I may also sell my 2Bros in the coming weeks. Today I swapped the 2Bros out for the Remus exhaust, and am really, really happy. 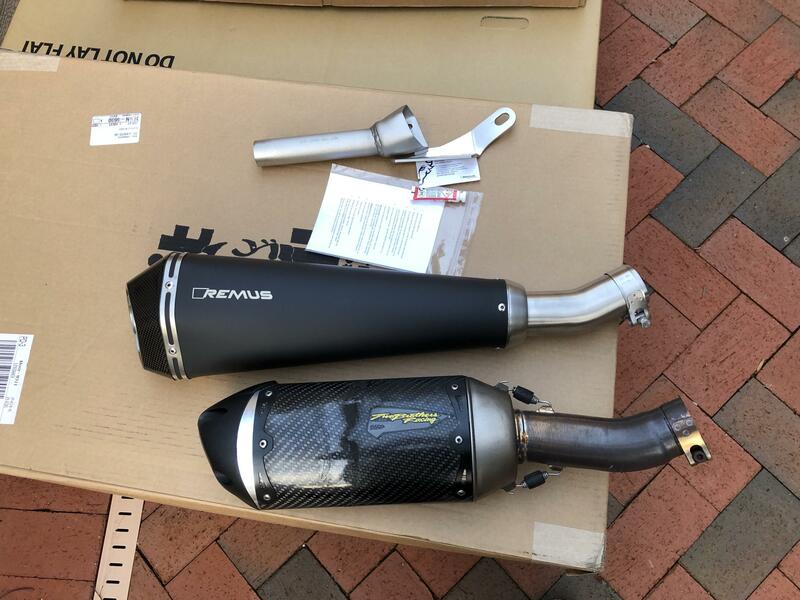 The piece is very high quality, did come with the race baffle as well as the street baffle (despite some reviews saying the race baffle was no longer included for some folks) and went on very easily. The sound is absolutely amazing, and sounds far better than the 2Bros. With the street baffle in, its very quiet but still has a great tone. With no baffle, it’s about the same volume as the 2Bros with the P1X but has a far more pleasing tone. Still really heavy on the bassy, rumbley tones, but less rasp. The downsides are that it’s bigger, heavier, and in my opinion doesn’t look as cool as the stubby shape and under frame placement of the 2Bros. I’m super happy I spent the money. Well, if you decide you want to sell the 2Bros, I DM'd ya!